The recent molecular genetic approaches unravelling the relationship between gene structure and function have provided important insight into the normal and pathological functions of the human body. Besides clear disease-causing mutations, subtle polymorphisms are likely to determine a great deal of the interindividual variability of morbidity in general and, specifically, of the phenomenon of ageing. With respect to the gender-specific features of ageing, besides lifestyle and environmental factors, the endocrine milieu of gonadal steroids must be an important determining factor. In men this means their lifelong exposure to testicular hormones, in particular androgens. In determining the interindividual differences in exposure of men to androgens, the polymorphisms in genes regulating the production and actions of these hormones must therefore be of great importance. 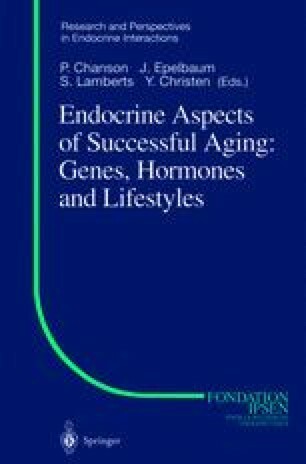 Cross-sectional and longitudinal population studies demonstrate that the hormones with anabolic actions [e.g., testosterone (T), growth hormone, insulin-like growth factor (IGF)-1, dehydroepiandrosterone) fall progressively with ageing in healthy men, and various systemic diseases accelerate this process. Likewise, there are similarities between the consequences of hypogonadism due to known diseases and to ageing alone, and the decline of endocrine functions may be related to the somatic and psychological symptoms and the functional impairment encountered in old age. The term “andropause,” describing the ageing-related decline of androgen production and associated symptoms, has been recently coined, but whether isolated andropause without causative systemic disease really exists remains a matter of debate. Nevertheless, numerous polymorphisms are known in the genes regulating the production and actions of androgenic and anabolic hormones, and their linkages have been described in men with a variety of symptoms and diseases. In this review, we summarize the information from the studies on some common polymorphisms in an array of candidate genes relevant to the individual variability of healthy ageing and ageing-related diseases in men.